"We're legitimate citizens. We're taxed without representation. We're not allowed to serve on juries so we're not tried by our peers. It's unconscionable, not to mention unconstitutional. We don't make the laws but we have to obey them like children." Though I have no doubt most feminists would agree that misogyny is still alive and well in America (for proof of that, you need look no further than our political system, where the few women in positions of power are popularly depicted as ruthlessly ambitious icebergs). But advocates for gender equality (how's that for a PC term?) have also made massive strides in the past century, to the point where it's difficult to imagine that, less than 100 years ago, women in America weren't allowed to vote to elect their leaders. The argument against it was, of course, born out of fear and outright lunacy, the belief that weak-willed, fainting beauties and their fragile, womanly sensibilities would not be able to handle a big, important decision like voting for president. Suffragists had been fighting this prejudice unsuccessfully for decades before the constitution was finally changed to allow women to vote in 1920. 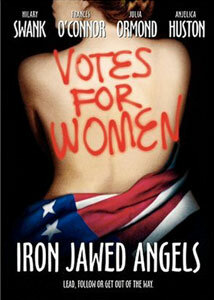 Iron Jawed Angels, a 2004 production from HBO directed by Katja Von Garnier and written by two women and a husband and wife team, argues that the breakthrough may have come much later were it not for radical activists like Alice Paul (Hilary Swank), who wasn't afraid to make use of flashy, attention-getting peaceful protest actions to get her point across. Paul is based on a real-life suffragette, but many of her compatriots, women who risk punishment and imprisonment for their rights, are composites of a number of people. The film covers several years of her life, during which she broke off from the politically connected but complacent suffragist groups (like the National Advocates for the Women's Suffrage Amendment) and began vocal protests that drew national attention, including elaborate marches, vigils outside the White House, and, after several activists were thrown into jail illegally, a hunger strike that nearly ended their lives. Von Garnier's film recreates these struggles as if they happened on a music video set. The impressive production design seems realistic until all of a sudden, protesters march down the street with all the pomp and circumstance of a Bollywood musical, albeit one with Michelle Branch and Avril Lavigne on the soundtrack (the film's title comes from an angel outfit one of the women wears during a parade supporting a suffrage amendment). There is lots of slow motion and "meaningful" imagery mixed into many of these rapidly edited moments, and the effect is arresting and immediate, but not for all tastes. Basically, this is the battle for the 19th Amendment via the Moulin Rouge, and not everyone is going to like it. Hilary Swank comes alive as the firebrand activist Paul in a way she hasn't since her Oscar-winning performance in Boys Don't Cry; she's much more vibrant playing a free-spirited rebel than the vengeful schemer in The Affair of the Necklace, her last major (miscalculated) film role. Paul might seem a little anachronistic, a modern feminist rather than a pioneering one, but Swank gives her heart. And it's a blessing, because Alice is one of the film's few characters developed beyond a basic set of traits. Frances O'Connor (a little known actress whose most prominent role prior was a supporting role in Spielberg's A.I.) is the second lead, Alice's close confidant Lucy Burns, who keeps a cooler head than her friend but still has the resolve to continue the fight. Their friendship forms the core of the film—I'm sure rhetorical critics could read into it a Thelma and Louise lesbian angle without much effort—and they give it heart that might otherwise be buried under all that stylish artifice. Occasionally awful dialogue doesn't help—at one point, a psychiatrist who has just examined Alice, responding to a prosecutor's claim that comparing the women's fight for the vote to Patrick Henry's famous "Give me Liberty, or give me Death" speech with comparing apples and oranges, shoots back, "In oranges and in women, courage is often misaken for insanity." Much of the rest of the cast is reduced to walk-on, one-note roles, including Anjelica Huston as the head of a group fighting for suffrage by more conventional (and, in Paul's mind, ineffectual) means. The men in particular are cardboard cutouts. A wealthy senator's wife wants to help the suffragettes but is chastised and ridiculed like a child by her husband. It's always interesting to note that films about female rebels so often feature elaborate scenes of their punishment. I know Iron Jawed Angels was directed by a woman, and that its scenes of violence against civil rights activists like Alice Paul are based on fact, but that doesn't make it any easier to watch extended scenes of her brutal treatment in prison, including a horrific force-feeding sequence that's enough to make the viewer retch along with the character. I guess it's important to see what obstacles women like Lucy faced and overcame, but it still seems excessive to depict it (and to force an actress to experience it) quite so graphically and realistically. But that's just me, the guy who hasn't been able to watch movies the same way since a feminist film class tried to convince him that the entire system of Hollywood filmmaking is built upon the systemic subjugation of women. Despite its rushed storyline (often, months pass with quick montages), Iron Jawed Angels packs a punch. Not everyone will think so, of course, but if you allow the images to do the work of the screenplay, you'll find yourself caught up in the struggle. Image Transfer Review: Presented in 1.78:1 anamorphic widescreen, Iron Jawed Angels looks pristine. The shifting color palette translates well to DVD, with bright hues offset by deep blacks. There is a bit of film grain, but no visible flaws in the print. The only negative is a touch of intermittent aliasing. Audio Transfer Review: The DD 5.1 mix is fine, if a bit front-and-center. Most of the audio sticks to the front soundstage but is presented with good stereo seperation. The surrounds kick in for the pop songs on the soundtrack. Extras Review: Aside from a trailer promoting HBO's feature film releases, Iron Jawed Angels includes only a commentary track with director Katja Von Garnier and writer Sally Robinson. It's pretty slow-going, with frequent gaps of silence interspersed with mundane details about where a scene was shot or how much research went into it. They talk very little about the flashy, divisive music video style Garnier used, which is what I was really interested in—why did she think that style matched the subject matter? The speakers seem to like their film, but don't do much to generate enthusiasm for it. Iron Jawed Angels is a glossy, entertaining history lesson that�s a bit rushed and lacking in three-dimensional characters, but it does manage, particularly in its latter half, to illustrate the struggle women went through to get the vote. Unfortunately, its chief concern seems to be making sure everyone knows they looked good doing it. You'll either love the movie's modern soundtrack and flashy visuals or find them empty and annoying, so I'd recommend a rental before buying.